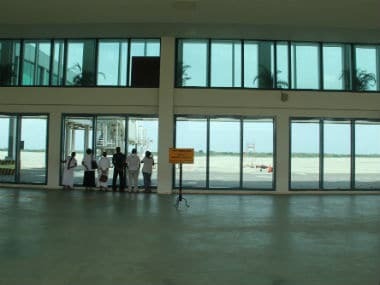 Colombo: Questions are now being raised in Sri Lanka over the seriousness of India’s intent to set up a joint venture for Mattala Rajapaksa International Airport in Hambantota, which has the dubious distinction of not having any scheduled flights. Almost one-and-a-half years after India submitted a proposal for gaining control over the airport, talks between the two countries have stalled after repeated rounds of negotiations ended in a stalemate. India had submitted an unsolicited investment proposal to Sri Lanka’s ministry of civil aviation after the latter closed the call for expressions of interest for a business venture to turn around the airport, dubbed the world’s emptiest, in December 2016. The airport is located close to the Chinese-run Magampura Mahinda Rajapaksa Port and that explains India’s strategic interest in the desolated airport. Sri Lanka had signed a framework agreement to lease Hambantota Port to Chinese state-owned China Merchants Port Holdings Company (CMPort) in December 2016. The two infrastructure projects were carried out by the Rajapaksa government with Chinese loan funding. Struggling to repay the loans, the current Sri Lankan government called for investments to lease out both the airport and port, resulting in a lease agreement with China for the latter. Since then, although several meetings have taken place between the Airports Authority of India (AAI) and its Sri Lankan counterpart, the discussion is not taking off. It seems the Indian government just wanted to block China from leasing the airport in the same region as the port. According to Sri Lankan deputy transport minister Ashok Abeysinghe, a request was made by them for a detailed business plan for a joint venture with Airports Authority of India (AAI). However, the Indian counterparts are yet to come through with the plan. Last week, an Indian team, including AAI officials and representatives from the Indian government, met Sri Lankan transport ministry officials. Designing of a business plan was, however, not featured in the discussions. The Indian high commission in Sri Lanka had not responded to a request for more details on the talks at the time of publication. The Sri Lankan Cabinet had approved the start of discussions on the proposal submitted by India for Mattala. According to the Cabinet paper presented by the ministry of civil aviation, AAI proposed to invest $205 million for a 70 percent stake in the venture for 40 years, while its Sri Lankan counterpart was expected to share the balance $88 million, totaling $293 million, as per India’s assessment of the net worth of the Mattala airport. The Sri Lankan government was determined to renegotiate the amounts and shareholding ratio, Abeysinghe said. They wanted a 60:40 ratio depending on the business plan. As talks regarding the airport between the two nations failed to take off, the only airline flying to Mattala, Flydubai, ceased its flights from 8 June, pushing the Sri Lankan government to look for alternatives. Analysts are also wondering if India is genuinely interested in committing large sums of capital in high-risk projects such as Mattala. A New York Times article on the Hambantota Port pointed out that India indeed turned down opportunities to invest in the port venture when the Rajapaksa government approached it. For decades, India has played the role of big brother to its southern neighbour Sri Lanka, not just because of its geographical proximity and strategic location but also because people of the two countries are bound by centuries-old cultural and religious ties. Since Independence, India and Sri Lanka have also kept diplomatic relations tight, followed non-aligned policies, with India always making sure that Sri Lanka turns to big brother in times of need and keeps others, particularly China and the US, at an arm’s length. All that has changed in the past ten years with the rise of China as a global economic power, and Sri Lanka coming under its spell, tempted by its willingness to fund massive projects – no questions asked. The Sri Lankan government’s decision to award a contract to a Chinese company for construction of 40,000 houses in the northern province is another flashpoint for India. According to sources, India has raised concerns against the opaque” awarding of tender to China Railway Beijing Engineering Group Co, which has no experience in construction in the northern region. There are also fears of influx of Chinese labour in the northern province — traditionally affiliated to India owing to its ethnic makeup. Two weeks ago, Indian representatives met minister of rehabilitation DM Swaminathan to raise concerns over the increasing Chinese presence but he said all fears has been dispelled. There will not be a single Chinese worker in the north. The company has agreed to employ 5,000 workers in the construction field and another 2,000 in two factories,” he assured, quickly adding that I am a Tamil myself and would be worried if there was a sudden influx of foreign workers”. He also pointed out that the call for housing has been there for three years; no one offered to build them till now”. Analysing Sri Lanka’s reliance on China, former diplomat S Palihakkara says in The Island of the Lion and the Land of the Dragon that the former government in Sri Lanka had unwisely placed most, if not all, of their ‘eggs in the Chinese basket’ entailing serious debt management issues at home and troubling strategic concerns abroad involving India and the US”. The writer conveniently ignores the atrocities of India against its southern neighbour! !